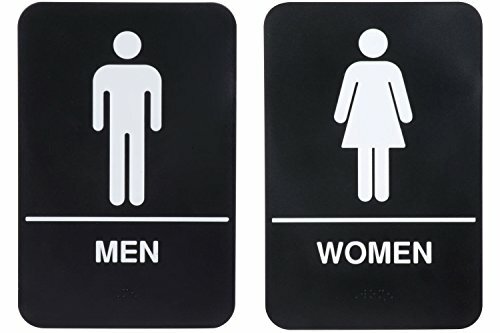 Guide your customers to your restroom location with this 9" x 6" restroom sign set! Made of durable plastic, this sleek sign has great color contrast. The white-on-black lettering allows your customers to see and read this sign from across the room or hallway. For those who may have trouble reading, a female or male symbol is posted at the top. These signs also meet the requirements of the Americans with Disabilities Act by having braille letters at the bottom. You can simply mount it on a wall or door with the included self-adhesive backing. Keep your customers informed by hanging this sign and showing them exactly where they need to go to freshen up before breakfast, lunch, or dinner. If you have any questions about this product by AborenCo, contact us by completing and submitting the form below. If you are looking for a specif part number, please include it with your message. No Alcohol Permitted On Site Business School College Work Aluminum Sign 12"x18"
Light Seafoam Green Felt Letter Board 10x10 inches. Changeable Letter Boards Include 300 White Plastic Letters & Oak Frame. Red Felt Letter Board 10x10 - Stand, Decorations, Bag, Scissors, File, Guide - Vintage Oak Frame & 680 Changeable Green White Black Letters - for Announcements, Gift, Photo Prop, Quotes, Toy, etc.